Have a look to see what fun and exciting things Dosbarth Gwyrdd have been up to. Click on the links below to explore! - Our Learning shows everything we have been doing in school. - Homework tells you more about this week's homework and may include additional games and links to resources. - Learning Games has some links to interactive games that we have been using in school. Our Reading Timetable - Please see the attached document to see when your child will be read with in school and when their books will be changed. Here's a video of our fun day with the circus! It was amazing! We are growing to love reading! 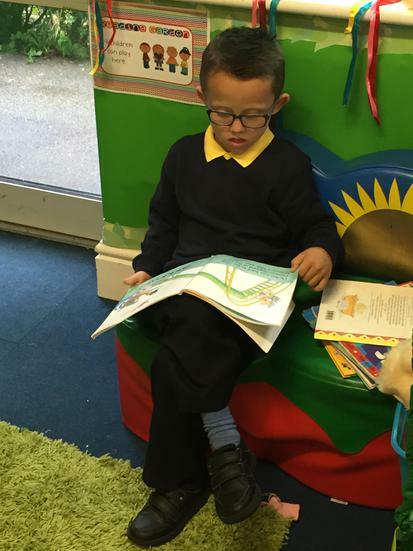 In Dosbarth Gwyrdd, we have started a new reading reward system, to encourage children to read more at home. We ask if children could read at least 3 times a week at home; this could be 5 minutes or 15 minutes, the emphasis is upon improving children's reading skills further and developing a love of reading. 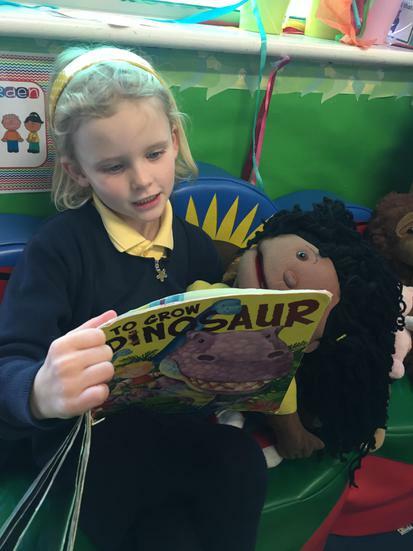 We read with children on a daily basis in school, through guided reading and phonic sessions, in addition to reading the home readers with them. Whilst your child may not be reading their home readers on a daily basis in school, we are teaching reading skills and work with the children daily through different reading games and activities. Our new classroom reading reward system is called 'We are growing to love stories.' 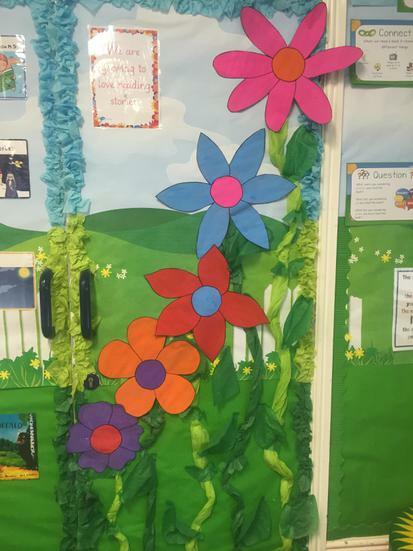 When the children read three times in one week (Monday - Sunday) they will move up to the next flower. Once they have reached the top flower, they will receive a prize. The children are all very enthusiastic about this new system and are looking forward to moving up the flowers as they read more at home. We appreciate that some weeks this will be difficult; however, it does not matter who the child reads with, whether they read a few pages to themselves, their grandparents, friends, family members or parents/carers. We just ask that when they have read at home, that it is recorded in their reading records. We thank you for your continued support and cooperation in your child's learning experiences. It is much appreciated. Ho! Ho! Ho! Bore Da Dosbarth Gwyrdd. Over the weekend I sent my magical elves to check if you have been doing a fantastic job in the Siop Teganau. Of course, you have been working so hard and trying your best. My mischievous elves had so much fun, but they did make a bit of a mess. Sorry! Thank you for making those beautiful, glittery baubles for the Christmas Tree. Mrs Claus has asked if you could make her some and send them through for our tree in the North Pole? Keep working hard and taking those toy orders! I will be sending my elves again soon. If you have any exciting resources or ideas that you think may support any of our three topics, please let Miss Stewart or Mrs Jones know, as it will be greatly appreciated! Please be aware that we cannot be held responsible for the content of any of these sites.